Dr. HENRY HSIAO (Professor, Biomedical Engineering, University of North Carolina): My best hypothesis is that it’s net(ph) response of a night-flying insect to the morning light and let me explain that. During the day, almost all moths try to hide from predators. That’s why their wing patterns have camouflaged patterns in drab colors. And at night, the darkness of light do not allow a moth to select the best hiding place so when the first morning light appears they have to fly up and towards the light and seek a place to hide. So you’d expect the behavior where they first seek light and then fly down and hide. So now getting back to the picture that we are like a moth flying towards a flame. The need to latch on to another person, another group because we have not found our own personal identity. 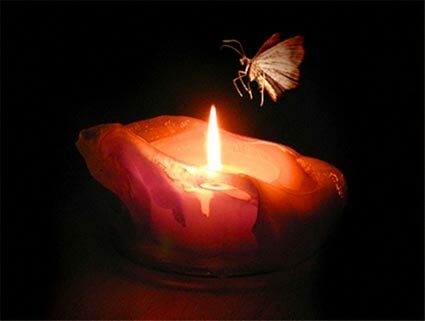 The moth who symbolizes humans; not being able to resist the temptation of the fire, the forms in our lives that make it so much easier not to think and let the groups, people tv… do the thinking for you. The minute we start using the “I am,” and “I have,” language, we have started that direct line like a moth to the fire. This past week, I’ve thought a lot about this and understand it but still say, but, but, but, wait do we need to strip ourselves from all labels, all “I am,” or “I have’s?” How do we keep a balance? How do you keep yourself in check so that your ego doesn’t start creeping in and taking over? I’d love to hear from you.